The Rettner Hall Atrium provides approximately 2500 sq. ft. of more or less open floor space and is three stories tall. A monumental staircase rises through the space from the first to the third floor. There is plenty of natural light from the building’s west-facing top-to-bottom windows. A laptop bar and stools looks in on the Fabrication Studio. Armchairs and three large round pods provide informal seating in the atrium. 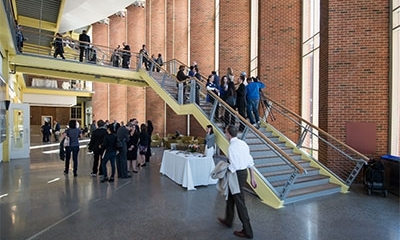 The atrium is best suited for events like receptions and poster sessions. Please note: activity in the rest of the building is not restricted during atrium events. This includes the first floor Fabrication Shop and Studio and the Audio Studio on the third floor. Use of Rettner Hall facilities is restricted to academic or social events sponsored by the University community. Rettner Hall is a working building. There is often activity in the public and specialized spaces, and these are not restricted when the atrium is in use. In particular, note that there is a machine shop on the first floor adjacent to the atrium which may be in operation and therefore potentially noisy at any time. All events involving food must follow the University’s EH&S Food Event Requirements. Doors and egress routes must be kept clear at all times. 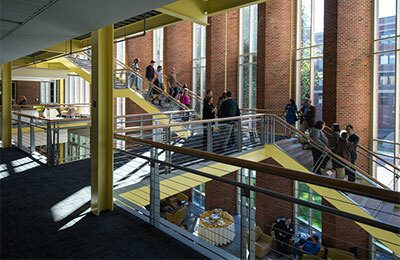 Reservations for the Rettner Hall Atrium and other non-specialized spaces are handled by Event and Classroom Management.